Filming Logistics - An epic sea adventure...an impossible challenge...a compelling love triangle between a man, a woman and a ship. And it's all true. The story of Bluenose, Angus Walters, Mildred Butler and Ben Pine plays out against the back drop of the Eastern Seaboard of North America in 1938. Much of the action takes place at sea aboard Bluenose and in on the streets and in the houses, offices and pubs of Lunenburg, Halifax and Gloucester. The Canadian government has totally re-furbished Bluenose II, a proud daughter to Bluenose, and she is ready to sail. She sails as an ambassador for the province of Nova Scotia and the province would be glad of the opportunity to have her star in our movie and reach audiences around the world. The towns of Lunenburg and Gloucester have changed little over the intervening years, maintained to depict the glory of their seafaring past. Halifax still has sites that reflect the look of the harbour in the thirties. 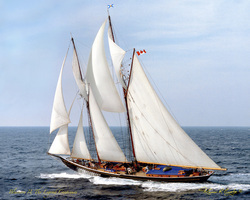 The Bluenose film will be shot on location and aboard Bluenose II to retain the look and feel of the life and times when the story takes place. To create the heart-pounding excitement of both the glory and the perils of the sea, ground-breaking computer generated images similar to those used for Master and Commander and Titanic will carry the audience aboard Bluenose to share in the danger and excitement. Bluenose is a film whose time has come. Now is the moment to bring this incredible story to the screen...shot aboard the ship and in the places where it actually took place.